Adventure-seekers, the search is over for your next getaway destination! Costa Rica is home to an unlimited amount of adventure activities for the whole family. From whitewater rafting to a water slide in the middle of the jungle, Costa Rica is a hot spot for adventurous travelers. Below we explore our favorite adventure activities in the beautiful country of Costa Rica. Arenal Volcano is one of the most popular and well-recognized volcanoes in Costa Rica. In the past, this volcano was the country’s most active, with an average of 41 eruptions per day! Although it has been in resting phase for the past seven years, the area offers an abundance of adventure activities. Hiking is not allowed up the volcano itself, but we recommend hiking through the national park with an experienced guide. La Fortuna Waterfall, which can only be reached by foot or horseback, is another option for hikers. This 200-foot waterfall plunges into a crystal clear pool below, which is open for swimming. Arenal is also home to several all-natural hot springs. The locals believe that the mineral waters in these springs treat rheumatism and other ailments. What could be better than a relaxing warm bath, surrounded by jungle and shadowed by the beauty of the volcano after a day of adventure? Lake Arenal, which sits at the base of the volcano, is Costa Rica’s largest lake. Visitors can enjoy fishing, kayaking, and stand up paddle boarding here, or take a sunset dinner cruise for breathtaking views. If a full lake day doesn’t fit into your schedule, you can enjoy the views of Arenal Lake from ziplines and hiking trails throughout the park. The Pacuare River borders the Talamanca Mountain Range on Costa Rica’s Caribbean slope. Experience the surrounding beauty of the rainforest as you raft right through it on 19 miles of Class III-IV whitewater (moderately difficult to difficult). Pecuare made National Geographic’s list of top 10 river trips in the world, due to its challenging rapids and beautiful scenery. Due to the intensity of the rapids, age requirements for the trip are 12 years old during the dry seasons (December through May) and 14 years old during the rainy season (June through November). Adventure seekers may choose to book an overnight rafting trip, but day trips are available as well. For those not quite bold enough to brave the rough rapids, Pecuare has plenty of other adventure activities to keep you busy. Visit Cabecar Indian communities, go rappelling down a waterfall, take a hiking or horseback tour, or enjoy fishing or bird-watching. One thing you cannot miss is the treetop dining offered at “The Nest” at Pacuare Lodge. Home to more than 40 limestone caverns, Barra Honda National Park is a must-see for adventure seekers. The caves range from just a few feet to over 780 feet deep and are home to thousands of bats. In fact, locals thought Cerro Barra Honda was a volcano before the caves were explored in the sixties. The roaring sounds of the bats as well as the fumes from their excrement mimicked the sounds and smells of a volcano. To enter the caves, you will need climbing gear, as well as a guide and permission from the Parks service in advance. Those not interested in the caves may choose to explore the hiking trails surrounding the caverns. The protected tropical dry forest of Barra Honda is one of the rarest habitats on earth. 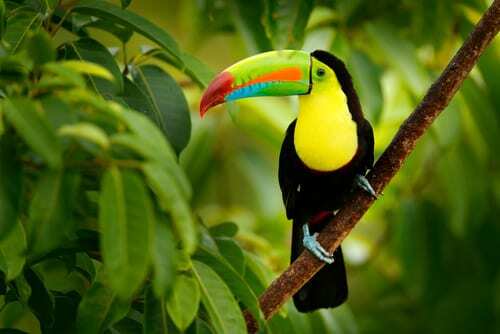 Visitors will find it is much different from the rain forests commonly found throughout Costa Rica. Tortuguero National Park is known for it’s isolated tranquility, amazing wildlife, and weaving rivers and canals. Visitors can expect to see white-faced monkeys, toucans, jaguars, lizards, red-eyed frogs, and blue morpho butterflies. The sea turtles are the main attraction at Tortuguero (meaning “turtle catcher”) National Park. Visitors travel here to see the turtles nesting at night, which you will need a guide for. During certain times of the year, newly hatched baby turtles race to the sea after incubating in the warm sand for 7-10 weeks. Rent a kayak in order to explore the rivers and canals, or enjoy the peaceful sounds of the jungle surrounding you in complete silence (except for the calls of the monkeys and birds). The park welcomes visitors from 6:00 a.m. to 6:00 p.m. and admission costs $10 per person. Buena Vista Lodge is home to the longest water slide in Costa Rica, which spans a quarter of a mile long. Other adventure activities offered here include zip lining, horseback riding, hiking trails, and hot springs. Visitors that take advantage of the jungle water slide receive a helmet and an inner-tube. Sliders wait patiently for their turn, while the operator releases a wooden board holding the rushing water back. This rushing water shoots you off to start your ride down the slide. Although definitely an adventure, it is suitable for children taller than four feet. With so many excursions to choose from, it’s easy to get overwhelmed. Get in touch with an Enchanted Honeymoons travel agent today to help plan your next adventurous getaway! Call us today at 402-281-3022 to book your own adventure in Costa Rica.